I realize that there are those people out there who agonize over technology purchases. The real question, however, is not whether or not to purchase new technology but when to purchase. It is important to distinguish between new devices, new operating system upgrades and new technologies. For example, both Apple and Microsoft have just recently upgraded their operating systems to new versions. However, the changes in operating systems were essentially incremental and did not reflect any basic technological changes. Both new operating systems work fine on the existing newer hardware although there are likely some older machines that are no longer able to support the upgrade. Since purchasing a new computer system is inevitable at some point, it is important understand the cycles that exist in the technology community. One example of this cycle, is the advent of touch screen technology. Some of the manufacturers are presently trying to move the touch screen technology used on tablets and smartphones into the world of desktop computers. However there is a vast difference between holding a device in your hand and using your fingers to control computer functions and attempting to use a large screen for the same type of functions. Just think about holding your arms up in the air all day long trying to operate your computer. Although I think that transition to touch screens is inevitable, I will have to see some reasonable adaptations to the physical reality of using a touchscreen on a large desk top type computer. Would I run out and purchase a new touchscreen computer? Not likely, unless there were other compelling reasons to do so. Am I interested in purchasing any of the vast array of electronic devices currently available in the market? Only vaguely. One good indicator of technological change is to watch the development of microprocessing chips from Intel Corporation. The present chipset is the Haswell Series 8. Series 9 is predicted for 2014. With the introduction of the new chipset you can expect upgrades in most of the software products with a few products being replaced by entirely new versions or disappearing from the market. It is my experience that most genealogists are very conservative in their technological purchases. Additionally, it is very likely that most of the genealogists based their decisions concerning purchasing new computer equipment and software on budgetary concerns rather than looking at changes in technology. I commonly talk to people who are using software products that are several versions out of date and computers that have long since been abandoned by the market. I have learned through sad experience that it is much easier, although more expensive, to upgrade regularly. There comes a point however if you neglect to upgrade your equipment that the upgrade itself becomes catastrophic. I have made this observation previously, that people will often upgrade their automobiles more regularly than they do their computers. As of the date of this post, the most active part of the technological market is in tablet computers and very large television screens. Neither of these two devices are particularly essential for genealogical research. Not too long ago, I wrote about the purchase of a new iPad. That purchase was based on the fact that I got a very good trade-in allowance for my original iPad. Depending on how you count models I traded up four or five models. The main driving force in the decision was based on the fact that software apps for the iPad no longer work on my older version device. I could have continued to use the older iPad but I would have lost any trade-in value within a very short period of time and at some time in the future I would have needed to upgrade in any event. So where are we today at the start of the 2013 holiday season? It is a good time to buy iPads and tablet computers in general because most of the models have been recently updated. It is also a good time to buy smartphones since they are upgraded regularly and anytime is as good as any other time. Regular incremental changes also apply to large TVs. If you need a new computer, it looks like any really dramatic technological changes might not take place until late in 2014. If you see a dramatic drop in the price of any device you can rest assured that it is about to be replaced with a new model. As I mentioned, the danger of buying the older model is that the new model may contain changes that require the update of existing software. With the recent update of the Apple OS X operating system, I had only two programs, so far, that needed new version updates, that is, updates that I needed to pay for. You should always be aware of the cost of updating your software when you purchase any new system. One change in the marketplace that has affected me directly is the transition that Adobe software has made in the way that it distributes its software. Adobe no longer sells its software products and packages to customers, it rents the software. Because of a limitation on the number of computers allowed for any installation I am looking at a dilemma of trying to use the software when I work on more than two computers. I see Microsoft moving into the same software model and I assume that other developers will soon follow Adobe's example. Not all technological changes are an advantage to the ultimate consumer. This is an interesting video showing an imaginary visit to the British Genealogy Conference "Who do you think you are?" I thought you might enjoy this look into the past. This past week, I had two very similar situations raised by patrons at the Mesa FamilySearch Library. In both instances, the patrons were looking at a pedigree on FamilySearch Family Tree and wondering where to begin research. Patron #1 have marginal computer skills but did manage to remember her login and password. She was looking at her husband's line which ended with ancestors in the mid-1800s. The end of line ancestor was supposedly born in New York State and then moved to Iowa on a farm, but the death date and place were in Arkansas. The challenge was to find both his and his wife's parents. Because the birthplace was listed simply as New York, I suggested that before looking for parents we needed to find out more information about the known individual. We moved back to the end of line ancestors children and immediately found in 1870 US Census record with the father 50 years old living on a farm in Iowa. Even with the small amount of information it was extremely doubtful that the ancestor died in Arkansas. The issue here was not the lack of information at this point but the fact that the patron had absolutely no clue as to the next steps to take to find additional information about her husband's ancestors. In short, she had gone from interest to action but had no idea how to proceed. Patron #2 was a young adult male who was also interested in beginning his genealogical research. He had vastly superior computer skills compared to the other patron, but was in exactly the same position with regards to how to proceed with research into his family lines. We began by examining his father's line and discovered that, just as with the first patron, the line ended in the mid-1800s. To me, of course, it was obvious that we could do exactly what I had just done with the other patrons and look at the US census records to give an idea of the accuracy of the information that had already been recorded. It was also clear, that this patron was also lacking in any ideas concerning what information was needed and how to go about researching the information that was lacking. In both cases, the patrons focused immediately on the missing individuals in their pedigree. Like many researchers, they concluded that the research should begin at the point where people were missing. However, in both cases the information up to the point where the ancestor was missing in the pedigree chart was incomplete and/or vague. Since the ancestor in the first instance at a birthplace listed in New York State with no further specific location, finding his father would be an insurmountable problem. It was interesting to me that the second patron that they had exactly the same situation. He was missing ancestors and immediately assumed that he should begin the search for those ancestors. This in each case it was necessary to go two generations forward from the end of line ancestor in order to find information that had been marginally verified. Neither of the ancestors had any source records cited in support of the events listed. Because there were no source records, it was impossible to assign a degree of probability that the information already in the file was correct. This sort of situation is extremely common. Upon examining a pedigree for a patron it becomes quickly evident that there is little or no verified information about the end of line individuals. In both these cases, I experienced some initial reticence on the part of the patrons to backtrack because they did not understand the connection between establishing a verified factual base before attempting to discover further unknown generations. In genealogy we have a common saying; always move from the known to the unknown. This may seem trite to experienced researchers but it is very commonly overlooked by those beginning their ancestral research for the first time. It is much more enticing to look for the unknown relative than to verify information on the known relatives. In some instances, other than the two mentioned here, I have had to backtrack almost back to the individual patron before finding any information that could be verified by the patron as accurate. The question posed in the title to this blog post is simple; began with the information that is known before moving to information that is unknown. I might mention that in both these cases finding the initial information about the families that were lacking information was fairly easy. Every profession from time immemorial has had its own jargon or special language. The legal profession is known for its sometimes impenetrable terminology, but if looked at from within the profession, all of these obscure terms seem normal and quite common. Genealogists are in the position of examining legal documents for information about ancestors and by force, must come to terms with the full brunt of legal jargon. Although there are those researchers who assiduously avoid confronting this inevitability, their research suffers from the consequences. It is a good idea to start learning some of the basics so that you can read an old will or deed and understand who gave what and who got what. 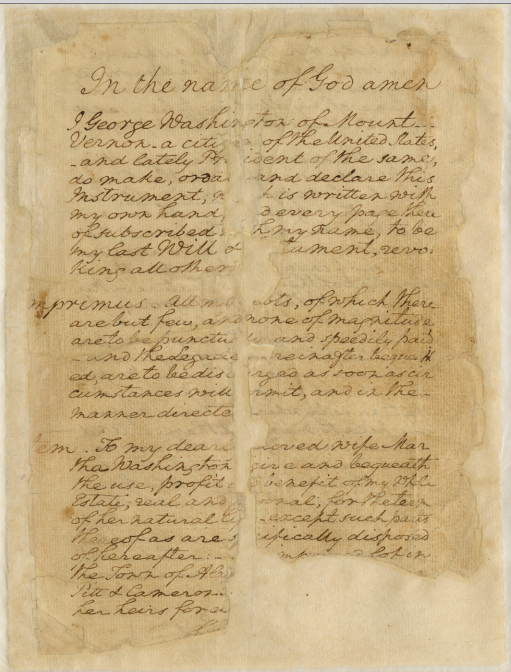 In the name of God amen I George Washington of Mount Vernon—a citizen of the United States, and lately Prident of the same, do make, ordai and declare this Instrument; wh is written with my own hand d every page thereof subscribed h my name, to be my last Will & tament, revoking all others. mprimus. All my ts, of which there are but few, and none of magnitude, are to be punctuly and speedily paid—and the Legacireinafter bequeathed, are to be discrged as soon as circumstances will rmit, and in the manner directe. tem. 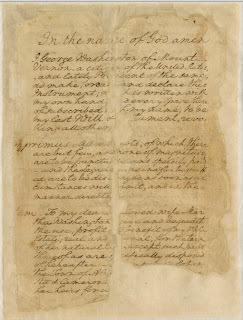 To my dearlloved wife Martha Washington give and bequeath the use, profit d benefit of my whole Estate, real and psonal, for the term of her natural li—except such parts thereof as are spcifically disposed of hereafter: mproved lot in the Town of Alex Pitt & Cameron give to her and> her heirs forev1 as I also do my> household & Kitc furniture of every sort & kind, with the liquors and groceries which may be on hand at the time of my decease; to be used & disposed of as she may think proper. I have marked in bold the words that could appear in a will written today. There are movements from time to time to update the language used in wills but the problem is that all of the court cases concerning wills and trusts is based on the old wording and so if the words are changed, all of the terms would have to be litigated again. Almost all other formal legal documents have the same conservative wording style despite constant attempts to update the language. I guess the consolation is that if you learn the old language, you will have no trouble understanding your own will. What should genealogy software do? Back in 2008, Mark Tucker wrote a paper in conjunction with the BYU Family History and Technology Workshop in 2008 entitled "10 Things Genealogy Software Should Do." The ten things Mark included in his paper and presentation were the following: Genealogical Proof Standard, organize, transcribe, source citation, stress-free imports, link and layer, source provenance, visualize, remember and share. I will let you go to the article for details. It is not my intention to discuss Mark's choices. I have my own list which is substantially different than Mark's. Some of Mark's ideas are very good and worthy of implementation, but others seem worthy goals but unlikely to be considered because of the difficulty in defining exactly what the program would be required to do. In the time that has passed since 2008, some of Mark's suggestions have been completely or partially implemented such as source citations. But even with this suggestion, there is still a major issue with the method of formatting citations. I leave you to judge whether or not any of his other suggestions have been implemented by any of the programs you use. Mark focused on the features of programs, but his title intrigued me and I began to think about what I thought genealogy software should do. I guess I do not have a wish-list of features that I would add to the genealogy programs since I already ignore quite a few of the existing features. Instead, I thought I would focus on broad program objectives. I am not sure my list will come out with a satisfying even number, but here I go giving it a try. By the way, if any of the existing programs have implemented any of these suggestions, more or less, then more power to them. The very first thing I thought that a theoretical genealogy program should do is to accurately model different culture's kinship structures. Of course my suggestion presupposes that such a model is even possible. But at a minimum, I think programs should allow for different structures. I have mentioned in previous posts the need for extending the cultural base of the current software programs and abandoning the one-size-fits-all approach to family structure. In this regard, I am not advocating abandoning any of the traditional family structures, I simply believe that genealogy programs should preserve relationships outside of the commonly accepted model, such as the relationship of a godparent to a child. In making this suggestion, I am also not advocating bowing to the shallow trends of political correctness, on the contrary, I am suggesting that programs ought to allow us to record all of the information in historic records. I do note some movement in this direction from newer programs. Next, I would suggest that the programs become smart enough to detect duplicate entries even when some of the information between the matching pairs is different. My idea is that the programs would look at the pedigree in depth and detect an attempt to add someone who fit into a pedigree line already occupied. This would happen if the added names were part of a merging file. If individuals were added, the program would then bring up alternatives to having the entry duplicated. This looks like a feature being presently implemented by some of the online based software programs in a limited way. I fully realize that no program can detect the right number of children or the identify of the family members, this is not what I am suggesting. I would suggest that any program should give you a ready list of unincorporated individuals and allow you to keep them, merge them into existing families or delete them. But it would be nice if at any time a new individual was added to the file, that the program would automatically suggest any duplicates. It would also be nice, as I have written before, if the merge functions worked much better than they do now. These thoughts are not in any particular order of importance or otherwise. One thing I would like to see is method of data entry that allowed all of the entries to be on the screen at one time. Presently, nearly all of the programs are decidedly linear. You move from screen to screen and enter data in a way particular to any given program. What I would like to do is see all of the information, events, notes, media items etc. about an individual all at the same time. It would then be helpful to be able to add any other connection to the data by simply clicking on a list or graphic representation of those individuals. For example, if I had a census record showing for one individual, I should be able to add ever individual mentioned on that record, even in another family, by simply clicking on a list or graphic representation of the families. I should also be able to attach a source record to all of the family members individually at one time or exclude some family members as the record required. For example, if I found a FindAGrave.com record with a listed of related family members, I should be able to attach that record to all of those people at one time without opening and closing a bunch of windows and doing a lot of searching. Some programs have started to implement a method of error checking. But presently it is in an infant stage. I would suggest that programs need to become much smarter and not allow entries without a method of data verification. For example, if I put in a location one way, the program should be smart enough to know I spelled the name wrong or added it a different way than I had previously. Right now, some programs can check to see if counties existed at the time, but better yet, the program should say that the place was in such-and-such a county at the time of the event. I think programs should automatically rank entries, perhaps by color, as to the amount of information they have. All entires would progress as the completeness of the entries increased. For example, if all that was available was a name the entry would be red. As additional information was added, the entries would progress to green through a variety of colors. Then the program would give the entire collection an overall completeness ranking that would come up every time the file was opened. I would also like to see a way to mark all of the entries that were imaginary, such as lineages going back before written records and such. Well, that gave me some further ideas that I will share in the future. Are Genealogy Programs too Insular? What happened to the rest of the world? I have to admit, I do not fit the stereotype of the average Spanish speaker. But then again, stereotypes have a tendency to be extremely prejudicial. Without getting very far into that subject, which I certainly could, suffice it to say that I have spoken Spanish nearly all my life. I have lived in South and Central America for years and have university degrees in Spanish and Linguistics. I taught Spanish at the college level for five years and English for Spanish speakers another five years. Now, I don't say that for any reason other than to provide a background for my comments about genealogy software programs. Because of the way our society works, people who have known me for years are entirely unaware that I speak Spanish and are very surprised when the overhear me talking to a person in Spanish. Every time this happens, it reinforces my view of the insular nature of our culture. Some genealogy programs, including some of the large online database programs, are offered in a variety of languages. Some of the developers make an attempt to provide versions of their entry screens for various languages, but basically the entire structure of genealogy is based on a Western European model, with a strong emphasis on the English language. At some point, this will have to change if we are to accurately represent family relationships outside of the Western European mould. From my point of view, genealogy should be the least ethnocentric and culturalcentric of the history-based persuasions. Our ancestral lines can easily encompass a huge variety of kinship systems and alternative family relationships. Some of the newer genealogical database programs attempt to extend the basic Western European relationship models to other cultures but the attempts are limited and failed to reflect the global variety of such systems. Perhaps, I am being overly optimistic in believing that an extension of the current genealogical formats can be made to adapt to the global variety. But the huge extension of the Internet into virtually all of the countries of the world mandates a careful consideration of the variety of human relationships that exist. Merely translating a Western European genealogical model into another language is only a halfhearted attempt at accommodating cultural diversity. Although it is a first step in acknowledging that the differences do exist. Sensitivity to cultural diversity is one of the first and I believe easiest accommodations that can be made to these differences. For example, one very common complaint concerning genealogical products based in the United States is that they do not accommodate or reflect variations evident in other areas of the English-speaking world such as the United Kingdom. These differences extend far beyond spelling variations and word differences, but the discussion usually centers on trivial differences in spelling or word use. Perhaps because I spent so much time in Central and South America, I am more acutely aware of these cultural differences. But I suspect it is my anthropological background based in linguistics and anthropology that colors my opinions concerning diversity. Unfortunately, in our present society, the term "diversity" is overworked in a political sense. I am not in favor of modifying genealogical programs merely on the basis of popular political correctness. Although, I am fully aware that the academic community generally bows to the concepts of political correctness. My opinions are based more on the practical reality of accurately representing historical relationships that are presently obscured by the programs that are being generally used to record genealogy. Genealogy programs provide a framework for entering family relationships and recording significant facts concerning those relationships. The core question is whether or not the structure of the program accurately reflects those historical family relationships. If your family comes from Western Europe, for the most part the programs are adequate. But what if your family comes from someplace culturally diverse from Western Europe? In previous blog posts, I have given examples of the lack of cultural diversity in genealogy programs in general. At the risk of being repetitious, here is an additional example. Spanish language surnames generally follow a pattern distinct from those in other Western European countries. Usually, a person born into a Spanish-speaking family is given a first name followed by two or more surnames, the first being the father's family paternal surname followed by the mother's family paternal surname. This pattern can vary from country to country and even within families. In some instances many more than two surnames are added. This particular naming pattern has considerable complexity. For an interesting discussion of the patterns see "All you wanted to know and never dared to ask about Spanish family names." An interesting example from that article is the following name, "Carlos María Eduardo García de la Cal Fernández Leal Luna Delgado Galván Sanz." How many of the current genealogical programs would handle that name properly? Which of all those names is the "surname?" If you were going to search for that name in a genealogical database which of the surnames would you pick? This is a simple and perhaps even trivial example, but at some point genealogy needs to move beyond its insular nature and begin reflecting the real world. I can't blame people who complain that the entire world of online genealogy seems to be monetized now on a fee basis. IIRC there were once a variety of online sources of genealogical information that were completely free. They might have run slow and been laborious to use, but they were still useful. The LDS Church used to have a free service; for all I know it may still be there but if so it's so deeply buried I couldn't find it. Meanwhile, my attempts to use Ancestry.com have been disappointing. I can't find even my parents and grandparents despite an extensive paper trail of medical licenses, university degrees, and military service. I don't think the free trial really gives you anything useful so it's impossible to evaluate. I have no idea what free sites the commentator is referring to that run slow and are laborious to use. I am aware of hundreds of free genealogy websites that run very well and have huge amounts of information. In addition, many of the larger subscription websites are available for free in any one of over 4,600 FamilySearch Centers world wide. "Free" of course is a very relative term. Someone has to pay for the service and the content either through sponsorship or fees. 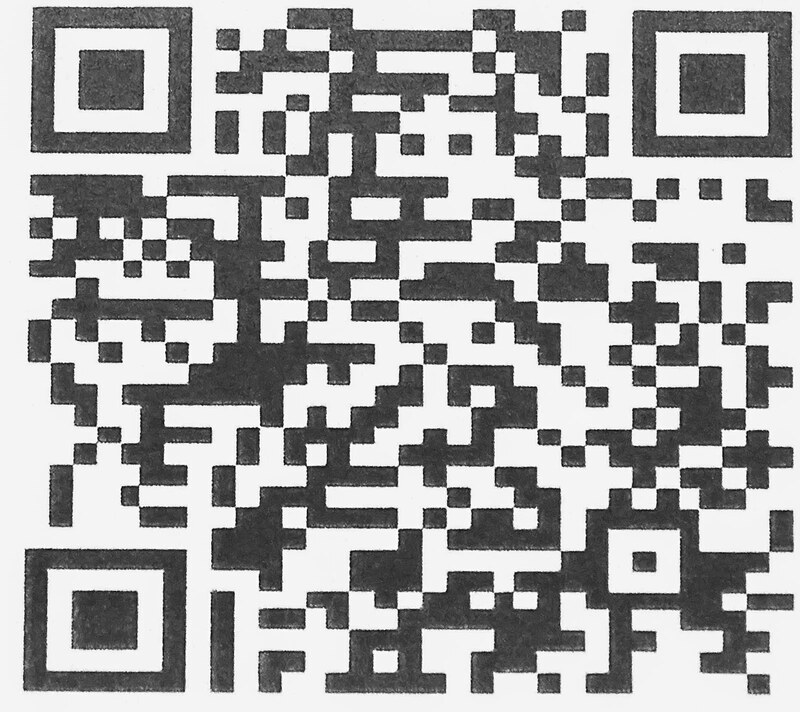 FamilySearch.org is "free" because The Church of Jesus Christ of Latter-day Saints and its members sponsor the website and provide access to the content. In every caste there is some sponsoring institution for the free websites. Another example, of course, is the United States Government, which provides free websites with genealogically valuable information such as the Library of Congress website. I find it almost incredible that anyone interested in genealogy could not find FamilySearch.org online by searching for LDS Church and genealogy. Additionally, the commentator has a misplaced concern; what is being monetized is access to previously "free" records when the repository realizes that someone will pay to access the records. There is no solution to this issue once the process has started. But despite any statements I may have made in the past, this process is not all bad. One positive effect is that governments and other repositories may not be so anxious to destroy valuable records if they think the records, as records, have value. This "monetization" may the destruction of so many records as was done with the bulk of the 1890 U.S. Census Records. I am saddened by the attitude expressed by the commentator above. It shows a lack of awareness of the huge number of resources available and the also shows a lack of understanding of the content of the subscription services. I would hope that the commentator would take the time to look at the FamilySearch Research Wiki and Cyndi's List for starts in getting some perspective on the number of source records available. David vs. Goliath -- Goliath always wins? Blogger Tony Proctor of the Parallax View blog made the following comment about my recent post mentioning that none of the current genealogy software apps fell into the category of a "killer app." I've been on the receiving end of this possibility in a different market sector James. If it was a "killer app" in the sense of being outstanding, and far ahead of anything else, then it could be a good thing, but this doesn't have to be the case. When one of these large companies decided to address a particular area then they have massive resources, including developers and money but also including worldwide marketing. That product doesn't have to be light-years ahead in its first incarnation because they will just sell it better. I know that smaller organisations, with just one or two visionaries, often produce better products than a committee-driven organisation can, but it won't help. When you factor in synergy with the other products and tools of the big organisation then you cannot win - the smaller company will suffer a withering demise. I thought this was an interesting perspective. I agree with the statement, if you proceed on the premise that software competes only on a global basis. But I think there is an important exception. Genealogy is very small niche market. It is certainly the case that if Apple or Microsoft or Adobe or whatever decided to take on a genealogy program it would become a "killer app," but that possibility is extremely remote. In fact, it is unlikely that any major software developer would even become interested in a specialized application such as a genealogy program merely for the reason that the market is so small. It makes sense for a genealogy company such as Ancestry.com or MyHeritage.com to develop programs that work with their primary products, but that is as far as this goes. Does Ancestry.com or any other company want to "corner" the genealogy software market? It they do, then they will have to change both their present products and their marketing strategy immensely. Because right now their programs are being sold as an adjunct to their online database programs and not as stand-alone replacements for other database programs out there in the market. Think about it, have you ever seen an ad for Family Tree Maker out of the context for subscribing to Ancestry.com? Interestingly, neither Ancestry.com nor MyHeritage.com feature their "software app" prominently on their websites. So although Tony's premise is valid at one level of software development, it does not necessarily follow in a narrow niche market. It is entirely possible that a small independent programmer coupled with a competent genealogist could develop a breakthrough software application that would change the way genealogists do their work. But will such a program come from the existing programmers? Possibly. But it will only come from someone who has both the programming capability and a clear understanding of the way genealogists do their work. A program such as Microsoft's Office is not only dominant because Microsoft is big and powerful, it is also dominant because it has all of the basic functions that people need and use. The junk in the programs still hasn't ruined their ability to function at an adequate level. I confronted this issue recently when I was making all of the presentations in Microsoft's PowerPoint. I looked at Apple's Keynote as a possible replacement. Now, you probably know by know, but if you don't I am a saturated Apple user. But guess what, despite it superficial attraction, Keynote is not a replacement for PowerPoint in the context of the world I live in. If PowerPoint only ran on Windows computers and Keynote ran on Apple computers, I would probably be using Keynote regardless of the limitations, but reality is that the presentation market is pretty much wrapped up by PowerPoint. So even if I did use Keynote, I would be saving all of my files as PowerPoint compatible files. This observation would superficially seem to support Tony's statements about the dominance of a large company. But this is not completely true. If Apple had Keynote for both Windows and Mac without using some simulation program, I would probably move to Keynote. This statement brings up another issue, can the present genealogy software developers keep up their momentum without support multiple platforms? I think not. In this case, the newer program Heredis from France is a good example. One of its selling points is that it works on multiple platforms. I may have to break my longstanding position of not doing software reviews if some of these innovative programs start to look attractive. I have refrained from making software judgments for the simple reason that anything I say in that context ends up alienating someone. I really thank Tony for his thoughts. It is nice to have both competency and insight in the same comment. But I think there is still the possibility that someone out there might come up with the killer app. Perhaps they already have and I just haven't recognized it yet. It is the nature of all things intimately involved in technology to change as the technology changes. In addition, those who program and maintain the software and hardware associated with computer technology are constantly making adjustments. I remember watching an old TV show where some people were attempting to drive an automobile across the United States without stopping. They had running boards all around the car so that they could refuel and change tires while they continued to drive. That is sort-of the way computer programs like FamilySearch.org's Family Tree operate. They have to keep the thing running while they perform all sorts of maintenance and changes. But in another sense, they are actually building the program while they operate it. So here are the latest updates as posted in a blog post entitled appropriately, "Recent Updates to FamilySearch Family Tree." 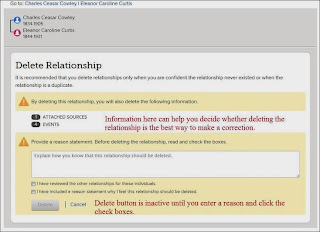 Deleting relationships from Family Tree is simple, but it is so easy that people sometimes delete a relationship when they should do something else instead. Enter a reason why you are deleting the record. 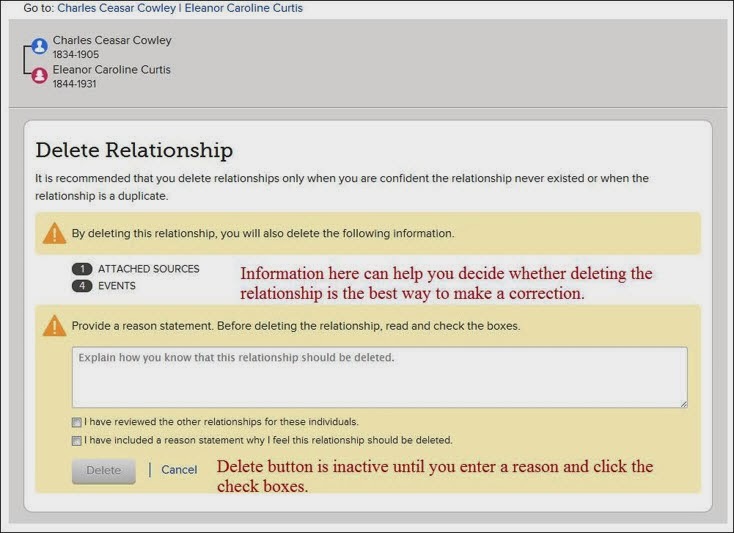 Click both check boxes, certifying that you have reviewed other relationships. This change involves adding a reference to documents to the menu selection on a person's detail page. When you click the link you see both documents and photos together on the results page. You can now see photos of living people in Family Tree if you have permission to see their records. You can choose whether or not to add a source to your source box when you view a record in the Historical Record Collections. You may not have been aware that the program was adding all the sources to your source box, but now you can choose whether to do that or not. This was apparently an issue for somebody. I tend to think that adding the source to the Source Box was a good idea, just in case you wanted to find it again in another context, but we have the option one way or another. When you are viewing an image from an unindexed (“browse only”) collection on FamilySearch, you can now attach that image to a person in Family Tree as a source. You can also edit the title of that source, since the title that is automatically generated may not have much meaning. During the attaching process, you have the option to include this item in your source box or to leave it out. An important thing to note: The option to attach an image (rather than an index page) is available for browse-only images. For indexed images, you must still begin the attaching process from the page containing the indexed information. It is getting a little bit complicated to remember all this stuff when you are using the program. This was intended to be a short note on voice recognition (VR) software, but it turned out to be a fairly complex issue. One of the most talked about developments in this area involves voice recognition at a gadget level such as the Apple app Siri. From my own perspective from using dedicated VR software for years off and on, I think Siri, the voice activated app for iPhones is mostly a bother. It almost never works for me, but it does highlight a major VR issue: the software trains you, you don't train the software. You have to realize that the software is set to work in a particular way and has very defined limitations. Until you conform to that narrow set of limitations, using the VR software can be extremely frustrating and annoying. VR is not really related to all of the voice notification systems that are out there such as the voice that announces the floors on elevators or the recorded messages that accompany so many products. But if you think about it, many of larger companies use VR as a substitute for hiring a live person to handle routine telephone calls. Occasionally, we will have trouble with our network connection. We have Cox Communications as our network supplier and the last couple of years, Cox has gone almost entirely to VR in its first level of technical support. Typically, the recorded message will give you two or three options to orally reply to a question. In actual practice, I have found their system to resolve nearly all of the connection issues we have from time to time and I have come to prefer dealing with the computer voice over talking to a live support person. The reason is a little complex, but involves issues with consistency. Also, the machine doesn't get distracted by another customer or another issue. At one level, VR is nothing more or less that word equivalency. I say "computer" and the software recognizes that string of sounds in English and produces an equivalent string of ASCII characters in whatever program I am using. In practice, what the software does in order to avoid an overload of mistakes, is to compare word patterns. Most of the errors in dictating to the programs come from lack of context. If you speak normally and include longer phrases, the programs can compare the sounds to longer strings and therefor obtain a higher level of accuracy. When I say that the programs train you, what I mean is that as you watch what the program is doing, you can adapt to the optimal length of phrase that works best with accuracy. Essentially, by trial and error, you develop a method of dictation that conforms to the optimal rate of accurate transcription. Looking at VR software from an entirely different perspective, it is apparent that using VR regularly requires a rather sophisticated level of computer knowledge at both the software and operating system level. If you have difficulty with the basic functions of the computer, i.e. opening and closing programs, entering passwords, saving files, finding saved files and other such activities, then VR will be overwhelmingly difficult. If you analyze what VR is doing, it is really a very high level method of programming. You are giving instructions to the computer by voice rather than by keyboard. Using VR also implies that you have complete, or almost complete mastery of any program you are using to record your text. For example, if you are dictating into Microsoft Word, it presupposes that you already understand all of the basic Word commands because in a very real sense, you are adding the simultaneous use of an additional program, the VR software, to whatever other program you are trying to use. Since you are utilizing an operating system (Windows, Apple OS X, Linux etc.) and then another program such a Word or Blogger, adding the third level of employing a VR program implies a giant leap of complexity. For example think about using an iMac computer to run Parallels Desktop and then adding a word processing program and then add VR. If you think about it you have multiple layers of application specific commands to deal with all at the same time. This implies a level of knowledge and ability that can be utterly impossible for some people to adapt to. We are still a long way from carrying on casual conversations with our computers, but now we do have a very workable tool in VR software. A possibility that has occurred in several other industry sectors is where a large, generic software organisation comes out with a killer product - one designed to kill off all the smaller products currently fighting for market share. Sometimes this happens by acquisition-and-enhancement of an existing product and sometimes through completely new development. This is a very real possibility and I guarantee that our industry is being examined already, especially as genealogy and other forms of micro-history become ever more popular. It is important to understand the context of Tony's statement, but the basic idea that there could be a "killer app" is fascinating especially in the context of my previous observations that most (nearly all) of the existing genealogical database programs were well established (entrenched), well into the higher numbers in their versions, and competing mainly on the basis of feature creep (bloat). Subsequent discussion of some of my earlier comments suggested that adding features to existing programs was indeed a way to secure existing users of the programs and add additional users. At the same time, some of the basic shortcomings of the existing products, such as a less than effective duplicate merge function, have not been addressed. I have taken the position that the desktop, individual computer model of the genealogical database program is presently competing with an entirely different level of product, those products that are capable of synchronization with one of the large online family tree/database programs. The additional feature added by these programs is the semi-automated ability to search the online database programs for source records pertaining to the individuals in the user's file. So now we have a new way of adding value to an individual software program, that is a way to do research directly from the program. This feature is also available in three of the large online genealogical database programs: Ancestry.com, MyHeritage.com and FamilySearch.org. Both Ancestry.com and MyHeritage.com have their own proprietary individual computer-based programs. Ancestry.com's program is Family Tree Maker, currently in version 2014 for Windows systems and Version 2 for the Mac. MyHeritage.com's program is Family Tree Builder currently in version 7. Of course, neither of these programs are fully functional without a subscription to the online version of the family tree. But, as I have said several times in the past, the cost of the online subscription is more than compensated by the value of the sources added to your database by either program. FamilySearch.org has entered the arena of semi-automated data searches with a built-in research records function while at the same time approving third-party access for data synchronization with a local database program. At the time of this post, three programs have been certified for complete access to the FamilySearch.org Family Tree: Ancestral Quest, RootsMagic and Celebrating My Family Tree. Because of the nature of the data in Family Tree, as opposed to having your own personal family tree in one of the other two programs, synchronization with Family Tree data would not be possible of desirable in the same way as is done by both Ancestry.com and MyHeritage.com. You have to understand the difference. When the certified FamilySearch.org Family Tree programs talk about "synchronization" they mean that the programs can to a two-way exchange of data, not that the entire file is "synchronized." Do any of these existing products approach the concept of a "killer app?" Or how about a new entrant into the market, Heredis 2014? If a killer app is out there, in my opinion, I haven't seen it yet. But my guess is the same as Tony's someone is already out there answering all the concerns and attempting to create a product that will dominate the market. What will that product look like? That is the basis of another post. For the first time I have been using voice recognition software consistently the past couple of weeks. The accuracy is quite good but you have to be very careful to proofread the text produced. Although the program, Dragon Dictate, does a very good job of transcribing my voice, it does drop words occasionally and substitute words for unknown terms. The key to extensive recognition is to provide more than the minimal amount of training and allow the program to copy a substantial number of text documents that you have already produced. This helps to build the program's vocabulary and thereby increase its accuracy. The main question is the program's utility directly involving genealogical activities. I think using the program to fill out forms such as entering names into pedigree charts or family group records would be frustrating due to the variety of names. You can use the spell function or the program will spell out each word letter by letter but at that point there is no advantage over entering the text by keyboard unless you are unable to use a keyboard. Either way, you need to be more consistent and proofreading anything that is produced. During the past couple of weeks, if you have been reading my blog, you may have noticed some strange typographical errors. These can be attributed mainly to the use of voice recognition and the difficulty of spotting those errors even when you are carefully proofreading. But then again, you may have been noticing strange typographical errors all along none of which could be attributed to voice recognition. When the program substitutes the wrong word into a phrase or sentence, it is sometimes very difficult to pick that up due to the fact that the word is very close to the one intended. For example, it may drop one single letter thereby changing a word such as "none" to "one." I must admit, that generally I do a rather poor job of proofreading. Perhaps, you can attribute this to the quantity of writing that I do, sometimes under pressure to finish a job quickly. One of my commentators called my attention to the fact that Amazon.com has Dragon NaturallySpeaking home edition 12.0 at essentially half-price. In the software industry, this generally means that the developer, in this case the nuance.com, is getting ready to release an upgrade to the program. But it may also mean that they simply need to make sales. One of the most difficult adjustments to using voice recognition software is changing the way that you write to reflect your method of dictation. Because of my work experience, I had used dictation extensively for years until computers became easier to use. The process of dictation was cumbersome because I had to dictate the document to the secretary then proofread the dictation after it was transcribed. Then the document had to be typed again with the corrections. When I began typing all my own documents, my secretary (now called legal assistants) would simply make corrections to my typed copy, thereby saving the time necessary to redo the entire document. If you are using voice recognition software, you can watch the screen carefully and catch most of the errors that need to be corrected as you dictate. I have tried using voice recognition to transcribe handwritten documents such as journals or other source material. But because of the need to transcribe exactly what was written this may or may not work. When transcribing an historical document, it is necessary to transcribe even spelling errors and punctuation errors. Obviously, the voice recognition program spells the words correctly and therefore using voice recognition becomes more of a problem than a help. In summary, I think that voice recognition gives a distinct advantage in the speed of entering text. It appears to me that I can dictate a blog post in about half the time that it would normally take to keyboard the same document. Depending on your accuracy and typing, you may find that voice recognition is either better or worse than your typing skills. In my case, I think it is about the same but I do make different typographical errors while typing then the program makes during dictation. One thing that I can say, is that voice recognition is finally reached the point where it can be used on a routine basis without driving me crazy. This entire post was entered using voice recognition. I proofread the text as it was dictated and then went back and reread the document to see if I could catch any further errors. So, you can tell from this document the quality of the text that can come from the careful use of voice recognition. If there are any typographical errors, which I assume there are, they are probably the same kind of errors I would have made by keyboarding the text. I realize to some extent this post covers points I have made in previous posts, some recently, but because of my intense use of voice-recognition software this past week I thought it was a good idea to update my thoughts on the process. What can we do about teaching computer skills? Because the current paradigm of data presentation includes digitizing paper-based records or microfilmed records and then removing the digitized records from circulation, it appears that in the not-too-distant future lack of computer skills will become more than an inconvenience but will also become a major obstacle to beginning genealogical research. Because of this and many other reasons, it is abundantly clear that acquiring computer skills is a key factor in making progress in genealogy. Notwithstanding the need, many of the people I help with research are significantly limited in their ability to advance their genealogical research due to poor or lacking computer skills. The solution seems to be evident: we began teaching basic computer skills. On the other hand, is teaching computer skills really part of our job description as genealogists? Perhaps it is. At the core of the issue is the attitude of the individuals lacking such computer skills. If the individuals are entirely disinterested in acquiring those skills there is not much anyone can do to teach them new skills. In addition, as I have mentioned previously in other posts, if there are physical and mental limitations those limitations can be insurmountable barriers to acquiring a sufficient level of computer skills to do adequate genealogical research. There are, however, many people who lack computer skills but have the motivation to learn and also possess both the mental and physical capabilities necessary. One of the major challenges for some individuals is the retention and use of passwords and logins. I am frequently confronted with the situation where individuals repeatedly either forget or fail to record their logins and passwords. This is not a situation where training is of much assistance. If we focus on the large group of people who need to acquire computer skills and have the motivation and ability to do so, we can make progress. Fortunately, there are a large number dedicated programs and of online sources for teaching fundamental computer skills. The problems faced by those those who lack overall computer skills is that computing today requires three distinct types of skills: conceptual skills which are necessary to understand what the individual views on a computer screen; keyboarding skills; and manual dexterity skills to operate either a mouse or a trackpad. mouse usage. This program also comes in a Spanish version. An interesting approach to the problem of training older people is discussed in an article that appeared in the Journal of eLiteracy, Vol. 1, (2004), 109-121 called Techniques for Enabling the Older Population in Technology. Those same issues need to be addressed with younger people also. Another article that addresses these issues is entitled, "A Solution for Older Adults’ Learning of Computer Skills: The Computer Game-Based Learning Approach" by Feihong Wang and John K. Burton of the Virginia Polytechnic Institute and State University. If you want to spend a few dollars, you can always get that old stand-by program Mavis Beacon Teaches Typing. I might note that Mavis Beacon, like Betty Crocker, has changed her face a few times. It has been raining here in Mesa for the past two days. In some places in the world that would not be even noticed, but here, it is very unusual. I haven't seen this much rain for a very long time here in the desert. We actually carried umbrellas, although I didn't use mine because I liked to have the rain fall on my head for a change. Like everything else that goes on around me, the rain started another thought process going on in my head and when I woke up this morning I began to understand a little bit more about this process of carrying on a conversation with the world they call blogging. If you don't see a connection, I don't blame you. Sometimes I don't either. Now, of course, at this point you are once again trying to figure out what all this has to do with genealogy. There has to be a connection here some where. Well, you will see the connection shortly. My pivotal experience from the assassination of President John F. Kennedy came a few years later. I was teaching an English class as a substitute at a high school in Salt Lake City, Utah. That day, for some reason the regular teacher had left a lesson plan to talk about Kennedy and the assassination. I started out talking to the class by saying something like this, "We are going to talk about the assassination of President Kennedy. Now, I am sure all of you can remember the shock we all felt when Kennedy was killed and how that affected our families..." At this point one of the girls in the class raised her hand and I stopped and she said, "But Mr. Tanner, we were only three years old when that happened." At that point, for the first time I could remember in my life, I gained a real sense of history. History became not just what was written down in book, it became what happened to me, to my family and to the world. I realized that talking to someone about history was not just a passive conversation about the weather, but a real look into a real past where people had to suffer and do real things that were hard and not pleasant. Now, fifty or so years later, I am still thinking about history, only now, I think about how to find out what happened to families in the past. I still feel sad, as I have said before, when people do not have that emotional connection with their past, mainly out of ignorance of their own ancestors and their own heritage. It is through this process of discovering our past that we become a human family sharing human experiences. No matter how bad or how good those experiences are or were, we still share a common bond of family. By carrying on a conversation with the world, I am only carrying on a conversation with my family. So what about blogging? Some of us need to communicate those feelings about our families and about the things that matter around us. I went by a book sale at the Mesa Public Library two days ago and there were hundreds of books for sale, almost all of the novels of some sort or another. I realized again how much of a need we have in common to communicate our own ideas and observations on the world. All of us live in a long narrative of life, but few of us pass that narrative on to others, especially our families. Maybe life is really in the narrative and at the end it all becomes narrative. To me, everything around me becomes more real when I comment on it. No, it is partly the other way around, nothing becomes real until you understand it and have a name for it. I think and therefore I write. This is one of the keys to the genealogical experience. Your family only becomes real to you when you learn about your ancestors and the translate that learning into a narrative. For some, that narrative has to take the form of stories and photos, for others, that narrative is in the form of pedigree charts and family group records. I am in the process of turning all the things that go on around me in one small area, genealogy, into a narrative. I do get comments from time to time about the quantity of the narrative. Believe me, I can only write down the smallest part of what goes on in my head. Genealogy is family and family is the world and I will never run out of things to write about because every day there is more history. ...the solution to every problem looks like a nail. This is one of those sayings that rings true for genealogists. 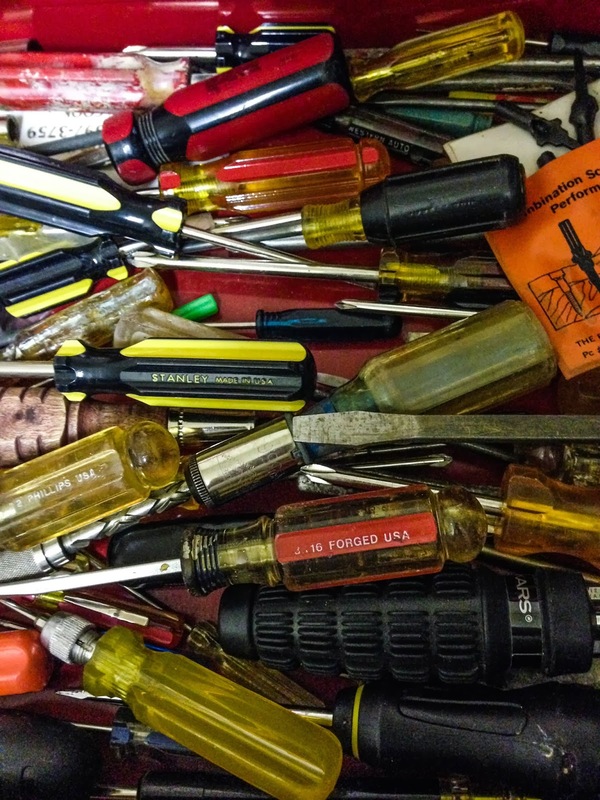 I find that a paucity of tools directly affects the ability we have to resolve problems. There is a similar statement attributed to Ralph Waldo Emerson, "All the thoughts of a turtle are turtles, and of a rabbit, rabbits." We are limited by our experience as well as our tools. Let me give some examples of what I am thinking about. Let's suppose that I am looking for a specific ancestor born in the late 1800s somewhere in the United States. I watch a TV commercial that tells me that a certain online genealogical database program will help me to locate my ancestors. So I pay a few bucks and now I have this wonderful tool and guess what? I find my ancestor. But then I have another more difficult problem, I need to find that ancestor's father. Unfortunately, the marvelous tool doesn't readily supply that information. So now I am stuck, I think that since I paid some money, I should have the solution to my problem. No one has told me that there are hundreds, perhaps thousands of different tools out there, each of which may have a solution to my problem. Since I don't know about all these different tools, I lose interest in the whole project. It would be nice if someone would come along and give that person another tool or two to look at, but I think that does not happen that much. I was looking at the MyHeritage.com map that shows how many people they have subscribed to their family tree program worldwide. I am fascinated by the number for Arizona. According to the map, there 201,845 subscribers in the Arizona. This gives be great pause. Who are these people? Apparently, they have enough of an interest in family history to have a family tree online but the statistics we have from the Mesa FamilySearch Library and elsewhere, such as attendance at conferences etc. certainly would not lead me to believe that there were that many people interested in genealogy. Not that I doubt the MyHeritage.com number, but I think that there are a lot of people out there who may need help finding a variety of tools. Are you a one or two tool genealogist? Sometime when I talk to people about where to look for their ancestors, I see their shoulders sag and they become despondent. The thought of looking in all the places I suggest seems to regularly have that effect. I have a photo at the beginning of this post. It is an actual photo of my screwdriver drawer. I like tools. I use tools. At some time or another, I have used every single one of those tools. Each one does its job better than anything else in the drawer. I have collected tools all my life and now I collect computer software and online database tools. I find that each database I locate has something to offer and when a challenge arises, I have the right tool for the job. In genealogy, we have tools that tell us what tools to look for and use. One such tool is a Record Selection Table. Here is one from the FamilySearch.org Research Wiki called the United States Record Selection Table. Now, you can see right here that we have quite a few tools to look for and maybe not all of these tools will be in a big online database. Some of them just might be stashed away in some library or courthouse. It is time to collect a few more tools. Does your genealogy qualify as microhistory? How valuable are indexes to source records? Can a copyright be re-instituted once it expires? What ever happened (is happening) to GEDCOM X? A Look Into the Future of Genealogy? Are you aware of your digital afterlife?